The Challenge of Photography in Classical Music and Ballet: Lighting on stages seem to be made to satisfy the customs of the lighting crew and an audience that is not supercritical about where light is and how it gets there. To the photographer, of course, these factors weigh heavily in recording the scene. The photographer has to learn to fit in as mostly it's easier to get blood from a stone than altering stage lighting! Still, I have dreams, (or delusions) of getting my way some day! It's essentially available light stealth shooting to a melody! Stage lighting, (mostly from above), can be accepted by audiences for concerts as their sophistication is in the listening part of the experience. Visual esthetics are tertiary issues! In any case, if the music is great, our eyes make enough sense of the scene that it works fine! No one ever complains that they cannot see the oboist and adjacent bassoons! (They are hidden mostly, anyway, by the conductor and the strings). It's the sound and excitement of the entire ambience of a stage filled with musicians in tuxedos and black dresses that works for us. Actual detail is unimportant! For dance, however, we now have the visual expression of the music in color and movement. So now we have to actually see what happens. The music comes from somewhere beyond the dancers and it just has to be great. We don't need to know where its being made. The dancers do not need to be seen in detail as it's the shapes of the bodies corresponding to music that counts. Lighting then is for that transformative magic of movement, not the details of the face and arms. "The word "gnossienne" describes several pieces of piano music composed by Satie that didn't fit into any of the existing styles of classical music like a piano prelude or a sonata. Satie easily solved this dilemma by simply titling the pieces with a completely new and made up word, in this case - "gnossienne." I ask you to now open another browser web page and being up this haunting music, Gonossiemme #1, , (played as the composer, Erik Satie, intended) on piano in this Utube recording, but in this dance at the Colburn School December 19th 2009 soulfully performed by guest accompanyist, Colburn Faculty Member, Kenton Youngstrum on guitar. With dance, how the figures are lit can alter the sense of the choreography. Naturally then, the choreographer directs how lights will play on their dancers. For some reason, stage designers and choreographers seem to love "dramatic lighting". That essentially means a mostly black stage and lighting essentially from above. The dark is very dark and the bright goes to white out easily, just as as with lighting for classical music except the gradients are even steeper! To make things even more exciting, sensual and creative, colored gels modify the already harsh lights. Add to that, for an end of the year holiday performance in a Dance School, it's a one time creative extravaganza: light intensity changes with no written program for the photographer and no rehearsal! This happens since the performances are school enterprises where all the resources pull together until the last day to get one showing and then the show is over! I actually thought I had the problem of photographing musicians on stage pretty well licked. Dance however is humbling, as it's much harder to compose, get the timing right in the dancers positions and still get the technical matters of exposure and shutter speed right. I used the 5DII and the 70-200 2.8 L IS, here at ISO 800, 1/250 second f 3.6 at 200mm underexposed by about 3/4 stop and recovered in Adobe Camera Raw. I'll be reprocessing this in Phase One's Capture One software. In the single image, above, I've tried to bring to you the way the dancers appear to float over the stage in some continuous river of innocence to worldly matters. They become feather-light living taffeta and silk containers for the rhythms and demands of the music appearing from the shadows to the bright lights and then disappearing again. They are the materialization of Erik Sartie's Gnossienne, timeless, ethereal, penetrating one's being with soulful beauty that has no beginning and no end. Some of the most delightful parts of ballet are the dances by one dancer on stage or just two, having turns as soloists or dancing together. Here I've tired to show this dedicated individuality. Feel free to comment on the photography, lighting or dance. Note these two images are prepared merely from jpg files, not from RAW as my usual workflow demands. My apologies. The reason is that my CS4 computer crashed and CS2 can't handle the RAW files. Canon software is too sluggish on my laptop. I'll be eventually redoing the images with Phase One's Capture One Raw Developer Program, "C1", and then swop them out. Let's celebrate the full length portrait! I had an unexpected call for a portrait today for a musician trio's publicity pictures. Lighting: Unfortunately, I had only one Lumedyne 50-200 W/S/ light working. I used 50 W/S setting with one light in a 7" reflector shining into an 8ft vertical V of white styrofoam (two panels of 8ftx2 ft hinged to form a V) and the reflected light comes baqck through a large white umbrella. The umbrella is above and 45 degrees to subjects and to one side and the other side is another vertical V of white styrofoam card to reflect light back from the other side of the subjects who stand in from to white seamless. This is part of a set of images I'll prepare. I thought I'd share the image as processed from Phase One's Capture One software. The main work to be done is whitening background, no big deal. I thought I'd boost this thread by adding another picture take with just 50 watt.seconds of energy but split this time to two 7" lumedyne heads bounced of styrofoam cored board through large white umbrellas as is my custom. This picture is processed in Capture One from RAW with slight exposure adjustment only and no other processing as yet save a tad of sharpening. It's part of a far larger series of candidate images for a new program for advanced and especially talented younger music students to give them access to world class Conservatory level faculty, even though they are not of college age. This new program is for the most exceptional students and will be a prestigious and valuable source of experience for those few who make it through selection performances. The Best of the Best! Right by Walt Disney Concert Hall! Being especially talented and advanced in music does not necessarily mean a healthy and happy childhood nor a successful career. It's an enormous challenge to steer remarkable talent appearing so early. Many do not make it beyond an initial bloom. The pace, quality and the breadth of teaching may not allow the full potential to ever be realized and another dream is lost. That's a tragedy! When I heard of the news of a new separate well-structured and supported Colburn School program to address this, I was impressed. At last! For sure, such a framework for young overflowing talent is so sorely needed. I have had the privilege to be able to design the brochure for the brand new Academy of The Colburn School of Music, http://colburnschool.edu. The new major enterprise is the brainchild of Sel Kardan the President of The School and is the vision of the Director, maestro Piano Professor, Ori Shihor, co-chair of the Music Department. The 12-18 year olds, representing some of the most dedicated, talented and gifted music students of the Los Angeles area, (and also flying in weekly from other states), share the distinguished faculty of the Conservatory. This is a revolutionary move and, for the first time, devotes the full academic and nurturing resources in a formal comprehensive but yet tailored fashion to the 1 in 10,000 gifted students that should be destined for great careers. So I set out to photograph the faculty teaching the students and tried to capture the individual caring and attention to detail. I will be sharing with you pictures from the 30 extensive shooting series to illustrate the program for new catalog material, brochures, banners, billboards and the Academy Brochure itself. I hope you will enjoy these images as much as I do the music that inspires them! You are invited: but you must arrange with me personally for the first 8 only. So here's the above picture in its use in an invitation. for printing by the graphic designer and then back to RGB and sRGB by me. I have created a large library of such prepared files. I like simple clean images, where little to no text is required. No one tells me what images to make. There's no art director. So I am forced to watch and listen and absorb the moments and then come the pictures. In most cases, it's the staff and graphic designer who only then decide on which images work best for them. It's a system that allows me the freedom to be creative and hopefully produce images which stimulates the design process downstream. It's an unusual way of working, but one that's thrilling in the end when the pictures are selected for publication! 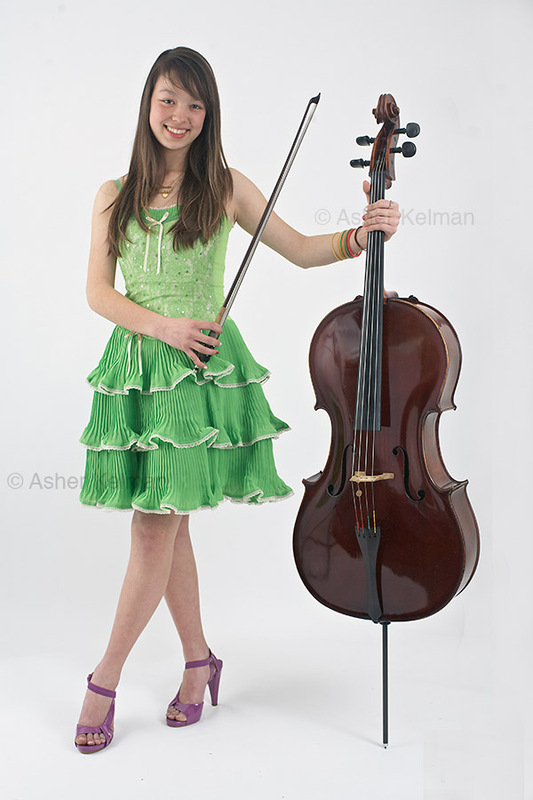 Here is one of the pictures I took at the Colburn School of the Suzuki violin students recent perofrmance. Imagine a rows of young musicians playing in synchrony. The method is disciplned! Then came the bow. Everyone else was too solemn and slow. This girl aced it and it shows! I hope you enjoy this picture. I was thrilled to discover the child amongst all my pictures. My intent was to do an admirable job. This was a capture I had not expected but am grateful for finding. Great shot. I'm sure we'll be hearing/seeing more of her. The dual meaning of bow is especially neat here. This was a capture I had not expected but am grateful for finding. And we are grateful for you sharing this with us. A very self confident young lady. Excellent timing. A beautiful moment, beautifully captured. The beauty is there, but fleeting. The tough thing is synchronizing the shutter! Very enjoyable picture. Don't we all want to be the 'standout'? A precious shot of the young girl. Her parents should buy a print from you. Thanks Ed, Yes, she has stopped at the apex of the end of her bow. The others are way behind and still moving, LOL! Jim, If it could be as easy as that to stand out for something worthy of standing out! Valentin, I'll ask her parents about her. Maybe she is shy. OTOH, she could be just ahead of the others. Certainly she's a person who seems to have a lot of enjoyment performing on stage and doing it with a flair! Thanks so much all of you for your comments! Would love to see this one in B&W, I think she'd 'pop' out of the crowd more due to the lighting on her face. I'm not editing as per request but I think B&W and a judicious vignette would make the image jump out at the viewer. you also have two sides to the story! A young girl bowing faster than all in excitement but, across frame seems to be a young child not to happy or possible very intent! I will be gathering more pictures of the Colburn School of Music. So bookmark this page!